The pain from a pinched nerve in the shoulder blade is one of the most irritating and unpleasant experiences that a person can have to go through. Sadly, pinched nerves (in various locations) are fairly common. 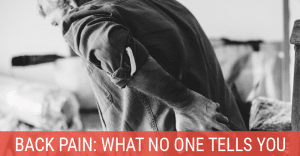 Because of that, everyone should know at least a little bit about what to do if they suspect a pinched nerve is causing their shoulder or upper back pain. While it may feel like the cause of pain is in your shoulder, the pinched nerve is actually in the upper spine. There are various causes that can get you to that point. A pinched nerve in the right shoulder blade or left shoulder blade sometimes stems from an injury such as attempting to lift something that’s too heavy or with improper form (usually a combination of the two). This can put increased pressure on the muscle and bone that surrounds nerves and causes those nerves to become “pinched”. Bone spurs around spinal discs are often the culprit. They can develop between the vertebrae which result causes there to be less space for the nerves to go through. 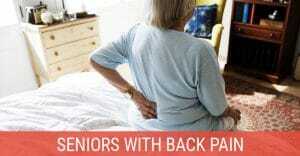 This lack of space also occurs as our vertebrae compresses and discs become thinner as we age. In both cases, the nerves simply don’t have enough room around them and again, they get pinched which can cause severe pain. Other causes may include arthritis, repetitive work, sports injuries, or even obesity. Since various nerves run all throughout the body, a pinched nerve in the back is a bit harder to diagnose since the spinal column consists of 33 vertebrae with nerves running between them. 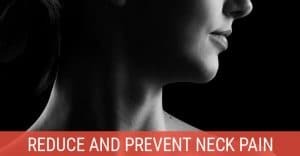 If your pain is slightly above your shoulders, you may instead need to treat for a pinched nerve in your neck. If you’re concerned that you might have a pinched nerve, the answer is that you probably do. Most people don’t mistake this with other issues. This is because a pinched nerve comes with some very specific symptoms. These include the following: numbness, weakness of the muscle, pain, burning, tingling, or inability to move a part of the body without experiencing pain. 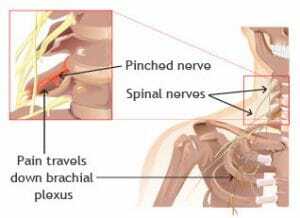 For the most part, a pinched nerve will give off these symptoms in the particularly area where the nerve was pinched. However, it’s very possible for the pain to radiate to other parts of the body. Completely unrelated areas of a person’s body may experience pain as a result of having a pinched nerve in another area. Your pinched nerve in the shoulder blade may or may not require a visit to a medical professional. There are certainly some things that you can do which will help you deal with the nerve pain if you want to try to work on it at home. Treatment at home is something that can be done in many different ways, but we’ll go over the most common. The application of heat or ice to the affected area can bring about some relief. Ice is great for numbing the pain, while heat is will relax the muscles around the pinched nerve so they won’t exert as much pressure to an already tender area. Since a pinched nerve can have symptoms of numbness to begin with, there are some who would prefer not to add more numbness to the equation. The idea of applying ice to the area for them may be a non-starter. They may still benefit from the application of heat though through a good heating pad. There are traditional and far infrared pads so be sure to check out our heating pad reviews to see which one would be best for you. Posture plays a big role in how we feel health wise in general. The better we hold ourselves upright, the less chance of an injury or other issue in the future. Unfortunately, many of us do not pay careful enough attention to the ways that we hold our body. Our modern chairs and environment are a crutch that we often use as a way of allowing ourselves to slump. This is bad because it often leads to injuries. Just being mindful of how we hold ourselves throughout the day is a great practice to have. Straighten up a slumping back and hold your shoulders back and in-line with your neck and spine. If you can manage to do those types of things, then you’ll already have made some progress in the right direction. You don’t have to give in to poor posture and poor health. Best of all, it’s a free treatment option. Another thing to take a look at if you want to get serious about your posture and treating your pinched nerve is how much time you spend sitting. It might sound ridiculous to some people, but the reality is that we spend far too much of our day sitting, especially those in office environments. It’s harming our circulation, and it makes our risk of a pinched nerve in a shoulder all the greater. 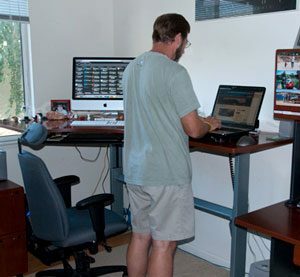 Many offices have introduced the concept of a standing desk. This is a desk where employees do all of the same work that they would usually do at their desk, but the desk is set up in such a way where they have to be standing to access it. Of course, those desks can be lowered to a sitting position after some time, but users are encouraged to do as much standing as they possibly can during the work day. It’s better for them and helps the company save on health care expenses as well. Ikea sells a couple good sit/stand desks for those on a budget. Here’s a good example. If your nerve pain is particularly severe or the above at-home remedies simply don’t help, then consider going to a chiropractor. These are doctors of the central nervous system. They focus on how nerves and muscles in the human body impact our overall health. They’re frequently able to identify the source of someone’s pain and correct it for them. Ongoing treatment is often necessary to make the most of what this type of doctor does. Still, it’s probably worth it to you to have yourself freed from the nerve pain that has been crippling your enjoyment of life to this point. 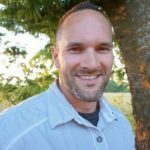 The chiropractor will bring you into his or her office to review your options with you and even to give you some things that you can do at home to help the situation as well. They work on you there in the office, but they also provide some great ideas for at-home treatments as well.